Following the success of the remake of SaGa2 (aka Final Fantasy Legend 2 in the US), Square Enix announced its plans to bring SaGa 3: The Ruler of Space and Time (Final Fantasy Legend 3) to the Nintendo DS. 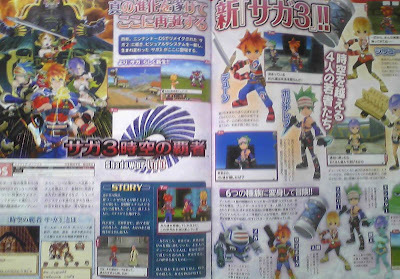 Scans above from Famitsu shows preview of the game. Final Fantasy Legend 3 characters gets a cute makeover similar to Legend 2. Also, FF Legend 3 will retain its class system where you equip parts from enemies or eat them to change classes. Expect to hear more about Final Fantasy 3 for the DS in weeks to come.